Location: Onet-le-Château, in the Meurthe-et-Moselle departement of France (Lorraine Region). Notes: The castle of Canac is a castle located in Onet-le-Château, France.The castle of Canac is located south of the commune of Onet-le-Château and perched on a rocky promontory, dominating the valley of the Autumn, at 536 m of altitude. Several agricultural outbuildings, some of which are on the cadastral plan of 1811, are associated with it. A double portal (coachman and pedestrian), erected in the 19th century, gives access to the property. The castle consists of three buildings and four levels of elevation of simple depth (a basement, a raised ground floor, a right floor and an attic floor), served by a spiral staircase in the West tower. The two principal volumes are distinguished at their roof, the slope more accentuated to the south-west. A small corner building, to the north-west, constitutes the third body. The building is confined on three of its sides of slender watchtowers covered with a conical roof with turned up drainage. A fourth watch-tower is engaged in the southwest facade. 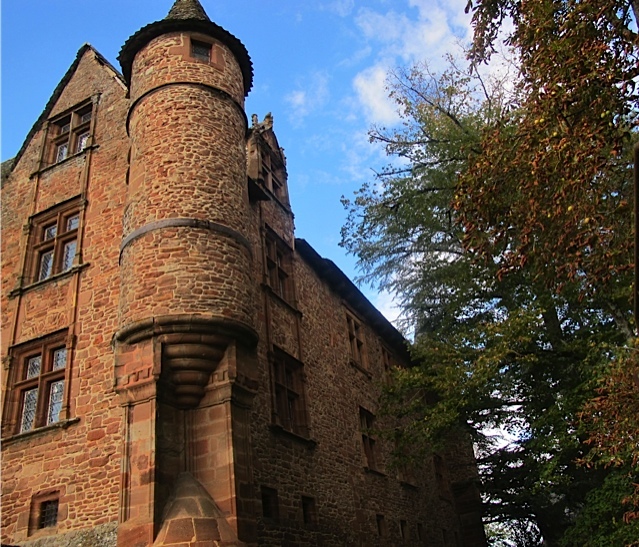 The complex is built of local pink sandstone (still coated at the end of the 19th century14), Except for the base of the towers, made of stone. The covers are made of straight-sided slate or slate laminated Cayrol15 scaled (for conical roofs).